I have to confess, I’m a bit of a training junkie! I read at least one self-development book every week, and often have 3-4 books on the go at any one time. I also jump at the chance to attend any live training event where I have the potential to learn something new. There is nothing quite like the energy you get from being in a room full of like-minded people who are inspired and poised for success. It's also one of the reasons I love networking so much, I always come away inspired. It’s amazing just how much useful knowledge you can get from a room full of people with vision and ambition. But I’ve learned that all of this new knowledge is in fact pretty useless - that is unless I do something with it! 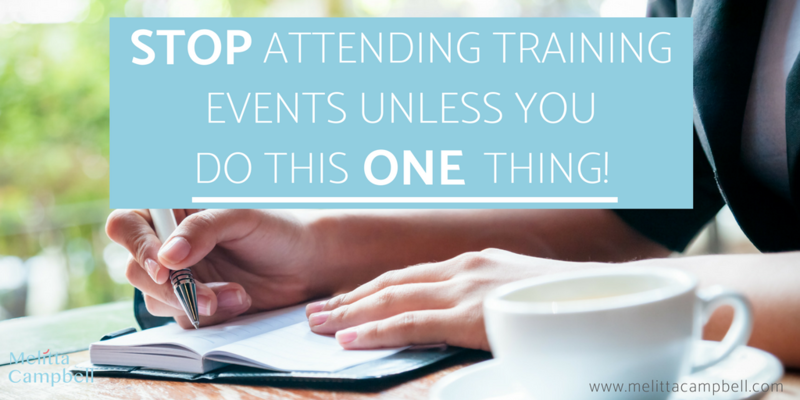 When was the last time you actually read through the notes you took at a training event? 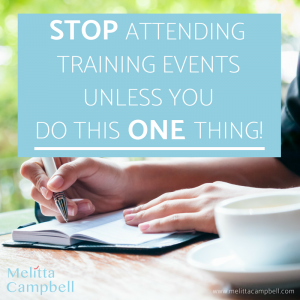 Despite all my training and learning, if I don’t put my new knowledge into action, then it hasn’t actually helped me or my business to move forward at all! It might have got me feeling good about things for a while, and challenged me to think about or see things from a new perspective for, but it’s only by putting things into practice that they really become part of our success toolkit. That’s why I’ve stopped simply taking notes at the events I attend or while reading and now I incorporate a list of 'Actions I Will Take' into each of my notes pages. This separated Actions list makes it easy for me to transfer my new action points into my diary and bullet journal to make sure they are allotted time and focus and become real actions. I still like to take notes at all the training events I attend, but these new Power Notes have really helped me to turn my new knowledge into actual change and results. To link my actions back to the notes I took on how to do the actions, I give each action a number, then put a star and the same number next to the related notes to make it easy to find afterwards. Plan ahead and know what notepad you are going to use and avoid using scraps of paper for your note taking, they are too easily mixed up or lost. Always have at least one spare pen (I always take two as there is always someone who wants to borrow a pen). Consider using a tool like Evernote to help digitally keep track of all your notes. Note down the names of all speakers and their speech titles, to clearly separate your notes. You may find you want to explore more of their work later. Make your notes attractive with clear headings and hierarchy so they are easy to read later. Leave plenty of white space on the page when making notes - this will give you space to add additional points and ideas at a later stage if needed. Charge up your phone - this can be useful for taking a snapshot of longer or complex slides that you want to keep. But remember to download the pictures and keep them with your notes later. Keep a notepad and pen handy at all times, not just during events, to note down your ideas - good ideas stay in your mind for a matter of seconds, so if you don’t note them down, they could be lost forever! According to Richard Branson, 99% of leaders don’t take notes. So, if you do, it will already place yourself ahead of most of the rest of the world. And if Richard Branson and Bill Gates are prolific note takers, then there’s probably already a good reason to do so! In fact, Richard Branson attributes much of his success to his note-taking habit. One action point implemented is more valuable than a notebook full of scribbles! So, stop taking notes, and start taking action! Do You Take Action Notes? Share your note-taking tips and experiences in the comments below. These are excellent points will definitely read these again. Thanks Rachael, glad you found them helpful. I am definitely a note taker. Adding action to implement specific notes is better yet. Haha, yes I used to take so many notes and take very little action. Making these small changes to my approach to note taking has changed everything and helped me bring a lot more value to my business and the people I help.